It all started a long time ago. Needles has been after building his own balloon for ever. Thing was, “Love to do it, but what is the point?” he oft asked. Fair comment, he doesn’t have a licence and, over the years, if you add up all the panels, patches and rebuilds he has done he’s probably built hundreds of balloons. “It will cost me a rake of money and just end up just being a bag of fabric.” He reasoned. The subject got discussed now’n again over the years but that seemed to be the decision. It wasn’t going to happen anytime soon. Then, a few years ago, there was this resurrection of the homebuilt movement and within a fortnight Tim Wilkinson had built a dozen balloons in three weeks, out performing all the manufacturers put together. His regular visits and calls to John for advice soon had him trying to coax John into joining the fray. Keen to assist in the ‘Build a Balloon John, Campaign’, we took a more gentle drawn out approach. 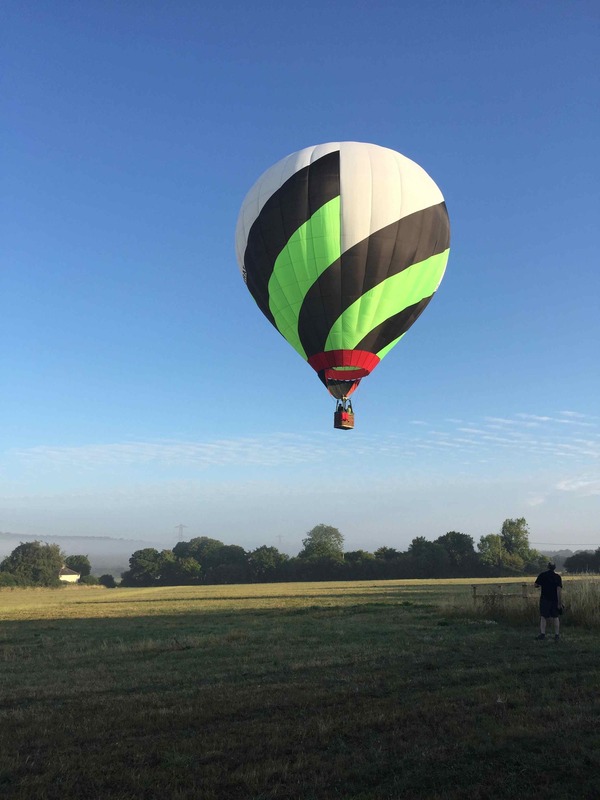 Even longer and manyier years ago John had worked for Tony Patey who, following the merger of London-based Thunder Balloons with Colt Balloons and re-location to Oswestry, set up a workshop in deepest Borough. From pretty early on Tony had had the idea to build his own balloon but work, and time, and London, and charging about, got in the way. Drawings were started, modified and changed and eventually Tony was near enough to getting the project underway and in 1989 G-BRAP was registered as a Thermal Aircraft 104. G-BRAP refers to Tony’s real name, Rodney Anthony Patey and the 104 bit? Well more on that later. Once again time waits for no man and, as this was the period of tremendous growth in the balloon industry, Thermal Aircraft, now very busy in Lant Street, Borough, home for a short while in 1824 to the 12 year old Charles Dickens who lodged there whilst his father was in the nearby Marshalsea Debtor’s prison, meant there was little or no time for building a balloon. 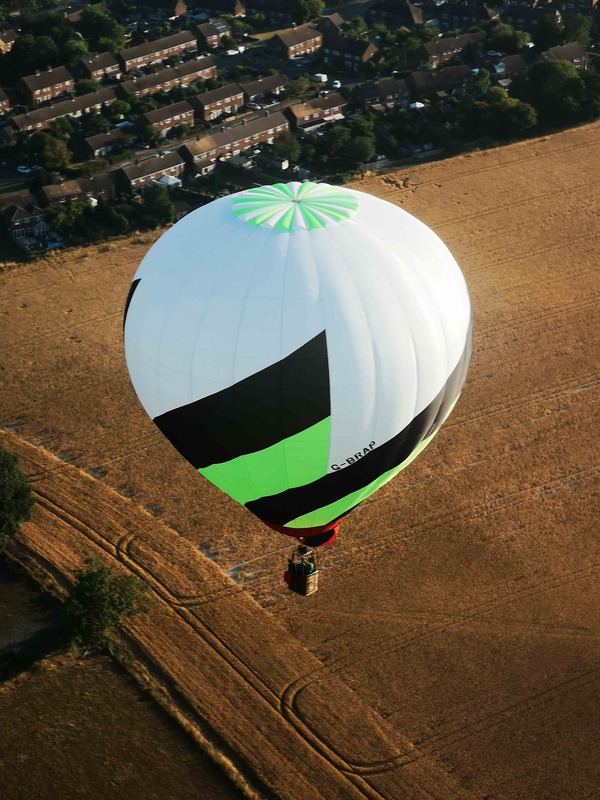 Sadly, before it got properly started, Tony passed away and it seemed that the Thermal Aircraft balloon would be confined to the history books. The registration was cancelled in 2001 and that, it seemed, was that. As some of you may know we do occasionally have a relaxing moment at the end of the working day and, more often than not, days of future passed get discussed, including the halcyon days of Thermal Aircraft and adjournments to the Gladstone or Clyde at the drop of a suggestion. 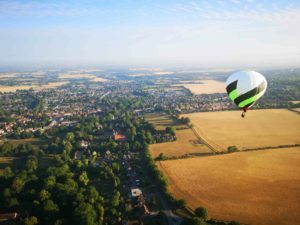 It was really becoming clear that John wished to re-create the Tony Patey balloon and then one day he just floated the idea over a fine drop of Talisker, but what could the registration be? This particular late afternoon we had been joined by Pete Bish who was collecting bits and bobs. Aware of John’s dilemma he told him that G-BRAP, although cancelled could be un-cancelled provided the designation of the aircraft didn’t change. We raised our glasses to Bishy and the Thermal Aircraft 104. Why 104? Its after the size of a refuelling cylinder of course. Job done. A few weeks (months) of pondering later and his mind was made up (sort of). It would be built in memory of Tony P. We managed to get the registration re-instated, all the old bits of paper and notes that survived from the Thunder days were dug out including how to draw up a gore and parachute rigging calculations, most on the back of old invoices and fag packets. Now all we had to do was to get him to get the crayons out and come up with a design to keep the impetus going. Now there are ways to build an envelope that can make it reasonably straightforward, and there are ways that make it pretty tricky. John decided to take it to a whole new level. Firstly he would build it in his garage at home, in the winter. John doesn’t do cold and even in the hot climes of 30 plus degrees he still wears his denim and two layers. His garage is a veritable blokes shed, with pillar drill, decent workbench and a fine collection of stuff. Not much room for balloon building. He shifted everything about and worked out what the biggest panel he could mark up and cut up in the confines and ended up with one from a 24 gore ’77. That was the size sorted. Then he decided that it would be really good to have a spiral pattern, but not any old spiral pattern, he’d make split panels and cut it in. Just to further complicate things the load tapes would be internal. What could possibly go wrong! 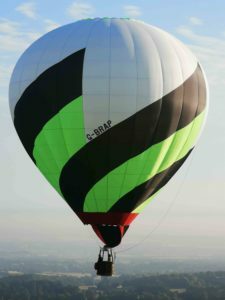 Terri Price was a seamstress of incredible talent and had built envelopes for Thunder Balloons, she also built a few one-offs, two being quite remarkable considering when they were designed and built. They had a cut-in six colour spiral design and were stunning. John has always been a real admirer of her work. “How do you design a spiral, never mind cutting and sewing the panels together so the pattern runs throughout? It isn’t as easy as you think.” he explained. He ‘ummed and ‘arred over the following weeks (months). His model balloon that he knocked up in about two days was supposed to be a spiral but it turned out to be an abstract angular design which, none the less, looked fine. He wanted a smooth Terri Price spiral. Some of the best looking envelope shapes were the old Thunder envelopes but these are now all getting pretty long in the tooth so adopting reverse-ish engineering would entail a lot of work if it was to be perfect. The Lindstrand 24 gore is pretty and although we couldn’t really unpick one of them, measuring up an old T&C and a Lindstrand, combining the measurements and drawings gleaned from the Thunder notes and simplifying the panel curves ought to get somewhere near what was needed. Best of three worlds then. Our quiet period runs from the end of September so, as temperatures fell, hours were spent making a mock up of the first three rows of panels to test the curve theory. Lines were drawn using our long bits of half round doweling. The panels were cut and attempts to sew a join in the split panels attempted. Now normally the tapes run up the outside of an envelope. This means if the overlap is a bit out it won’t show. As John had decided he’d build his with the loadtapes inside it was vital the spiral ran smoothly from one panel to the next. It turned out to be far from easy. Not only do all the individual panels have to be made up but the colours at the corners have to end up such that when the next panel is sewn on there is no stagger in the spiral. In fact it took a fair few goes before he was happy that it was as spot on a he wanted. With the problem solved and the real patterns drawn up, three gores three high were sewn together and part inflated. The result was brilliant. All he had to do now was get the fabric. His original idea was to use bright green, black and yellow. This would prove harder than he thought, not least as he was working to a tight budget. Then there was the Wibblywobbly. He found the green exactly the shade he wanted on it so that was ordered. Samples were sent, weights compared, and lumps left in the oven for a couple of days. Tim W had a rake of fabric but the colours were limited. There was some yellow but it was rather sticky so was swapped for a sort of super white. One of the workshop sewing machines went on holiday to Johns. Everything was ready and so knitting commenced. One morning the phone-call came, “Could you come and help me get it out of the shed please? It won’t fit through the gate in the bag.” Landie, Dolby and I nipped round and, in true Himalayan style, we sausaged the over-bright fabric through the gate and into the bag. “There just isn’t room in the shed to rig it.” he explained. “I’m going to have to use the workshop.” Fair enough, quite how he had managed to get that far was, only just, short of miraculous. It had been important to John that he did build it in his shed. “I don’t want anyone saying that I had loads of room to do it by using the workshop,” anyway building it at home meant he could get on with the job as he felt and the well-stocked fridge was at hand. Effectively the envelope was built inside out which meant that when joined together it had be turned right way out, if you get me drift. You can’t really do that in the space he had! Had it not been cold and windy he would have had a go in his garden, I’m sure. 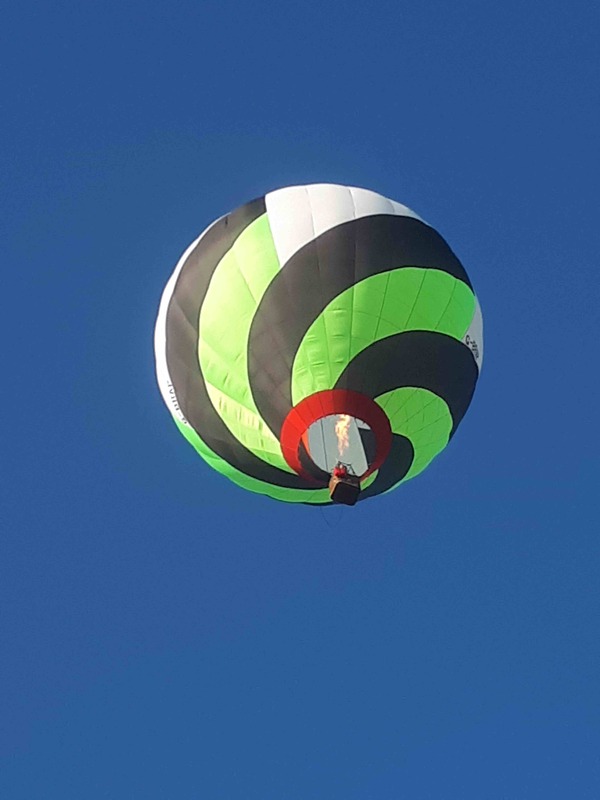 A few days later the parachute was rigged and the bits and bobs checked and finished. 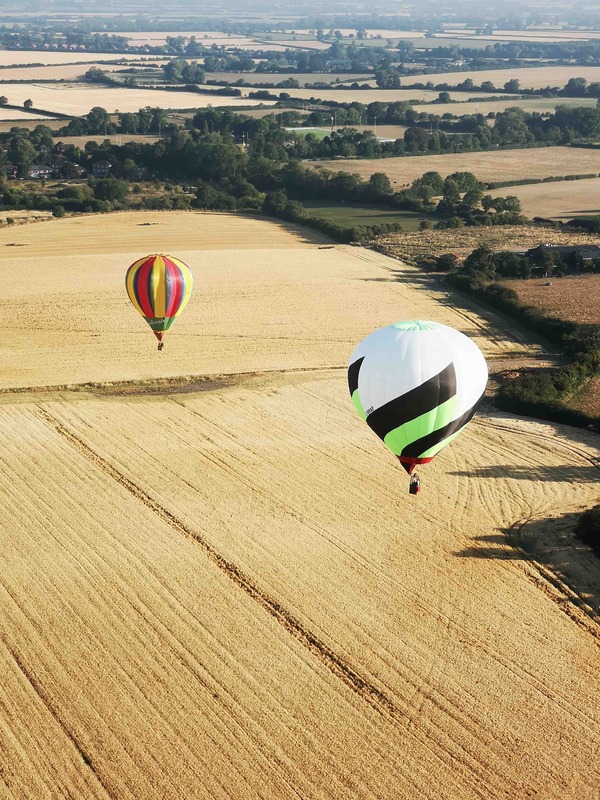 A test inflation was on the cards. Then we got busy and time passed as it does. The weather promised calm for the 8 May 2018. We booked it along with Jane and Basser. John was still a bit concerned about how the spiral would look so a very private test inflation was carried out in the back field. Job number one was to fit the ripline. “So John, where exactly is the tie-off?’ I enquired. We checked all the tapes. “I definitely put one in.” he insisted. “It should be where you are standing?” It wasn’t. “Are you sure it isn’t there?” “Yes John, there is no loop.” John was disappointed. Never mind, that what test inflations are for. No problem, we rigged it temporarily as a straight pull as we weren’t planning on flying it. The ‘chute was tabbed in and once we were happy that everything was sewn to everything as it should be we inflated her. It came up like a rocket and even from the basket looked lovely but there was something a bit amiss with the parachute. Turned out that a line had got crossed and as a result a couple were out of sequence. Still, it was standing up like a trooper and looking truly beautiful. A week later the parachute was sorted and a tie-off for the red line popped in. Next slot we’d be away. Work picked up and convenient weekends got blown out or rained out or both. Months passed. Finally the weather was looking perfect for the weekend of the 5 August 2018. Somewhere along the way Rob Cross phoned to ask if could fly from the field if it held. I was a bit concerned that John may not be happy about that. He is the eternal pessimist and if anything was out he didn’t want it to go public. Still, when Kevin Tanner asked if he could come as well I just thought it would be rather nice. Here’s the thing. As John was tying and knotting our Pete and I decided we needed a ‘new’ bottom end to put under it. We’d relieved Godfrey of a basket and double C2 burners in exchange for painting the underneath of his trailer. The C2 had already been pillaged for spares but the basket was a lovely comfy T&C number. Pete washed it down, dried it out, slopped woodworm treatment over it and Danish Oiled it. We tracked down some rather super leather restorer in a very close matching olive green which the dull basket leather and leg leathers consumed with glee. We ordered some more. Meanwhile I dug out my old trusty C3 stripped it down and rebuilt it. Now we were cooking. Come the day it dawned perfect with low mist, sunshine, blue skies and the odd whispy cloud. As it happened quite a gaggle turned up including John’s missus Alex, Sandy’s Martin, Jane, the dogs, Barry to retrieve, and Shannon and Tuesday his dog. In no time we had the line in. Alongside, Rob and Kevin inflated. Tony P stood up, we loaded the basket and tried the parachute. Perfect. Couple of attempts to stall it failed. The Thunders always had nice snappy parachutes. This was great. John’s missus declined a place opting to keep Barry company on the retrieve. Rob and Kevin were away, we slipped the quick release and headed gently upwards and John and I, along with a couple of V30s, headed off after them. It flew like a dream. We tried a fast climb and descent and floated down the valley towards Wendover. This was perfect. We got a bit of left off of the hill which was still in shadow and went over John’s house and the very garage it had been built in. Down we went over The Resy and waved to Tom and Raj fishing away. Aylesbury Rugby Club looked like a possibly, we climbed but not soon enough and not really wanting to arrive like a grand piano left it clear for Rob. That’s what we told him anyway. Dolby, co-incidentally on his way back from a nights’ fishing, spotted us and pulled up alongside Barry and Alex in the retrieve. “Few years ago he would have got that, piece of cake.” He chuckled. “Lost his touch.” His message was relayed and he set off to see how the Resy boys had fared. Laugh, nearly overburnt. We carried on, heading for our friendly farmers just outside Bierton, followed closely by Kev the hopper. Conditions were perfect and the landing a gentle arrival. We’d hardly used any fuel. I phoned Barry. 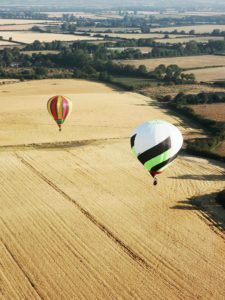 “No problem,” came the reply, clearly delighted with a helpful farmer, “He says help yourself and is the other balloon with you?” it was, his retrieve wasn’t quite! Soon sorted and we headed back, the happiest little troupe you could imagine. Rob had had an equally happy reception, only saddened by the bar not being quite open, never mind, when we arrived back at the workshop he had a pack of Stella and doughnuts ready to share and we robbed the fridge. 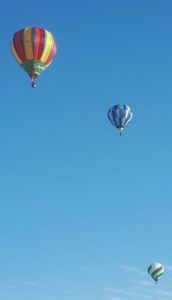 It had been a wonderful morning and we all agreed that, that balloon of John’s did look the absolute dogs. 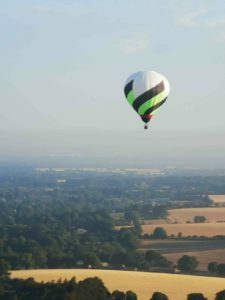 Our Pete turned up having been crewing with Spencer on the Virgin Balloon out of the Black Horse, just up the valley. He couldn’t believe it as he headed down the road and saw three balloons up. “Just like it used to be.” he said, full of admiration for John’s balloon. The envelope does look as good as it really is. The detail is truly superb. John has built it freehand (no computering stuff here) and incorporated, or rather left out, all the bad bits of design that make such things as repairing the mouth of a Lindstrand so awkward. Having said that the nomex comes from the bottom of an old Lindstrand and the scoop is one we had on the shelf that was altered. It’s a bit baggy but will be tightened up. Although the loadtapes run down the inside they pop out at the nomex so are protected. It is truly an enormous credit to his skills but then we all knew it would be. What will John do with it now? His dear old mum wants a flight, so next nice day, when the ground dries out a bit, we’ll get it sorted, then I think he’d like to take it to a few shows in due course. I will probably steal it. Special thanks to Kevin Tanner for taking air to air shots and flying his hopper at the same time, Steve Cook who puts up with Rob and did the lovely bottom shots and to all those that helped and encouraged John.